This rock crystal ewer is one of a series that survives in collections across Europe. They are often in cathedral treasuries, where they were rededicated after being captured from their original Islamic settings. 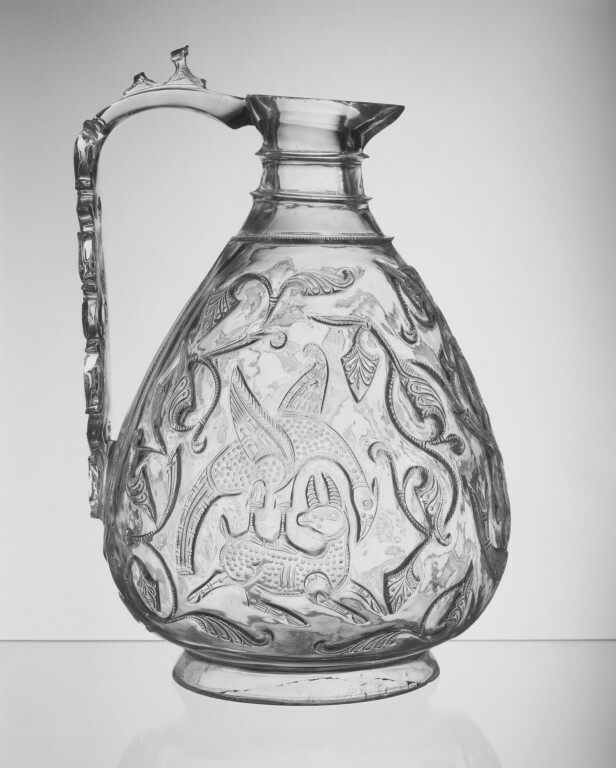 Such high-quality rock crystal vessels were made for the rulers of Cairo during the Fatimid period (969-1171). This is confirmed by inscriptions on several of them which name specific rulers. Great skill was required to hollow out the raw rock crystal without breaking it and to carve the delicate, often very shallow, decoration. These vessels were therefore probably prestigious items which the ruler would have displayed in his own treasury of prized possessions. Rock crystal ewer with pear shaped body, beaked rim, and slightly splayed foot. Flat handle sprouts from the back of the rim and joins the back of the body near the base. The top of the handle bears fragments of earlier carved decoration. Shoulder is plain except for three slightly projecting borders. The body is covered with near-symmetrical decoration, depicting on either side of the body the motif of a bird of prey (falcon or eagle) alighting on the back of a horned quadruped (probably a gazelle). These figural scenes are surrounded by scrolls of palmettes and split palmettes, and the whole design is set within a frame as if the object were covered by a textile with a decorative pattern. The surface is perfectly polished, the crystal is very clear, and the object is very light. Originally thought to be a Byzantine object. Historical significance: Such high quality rock crystal objects are known to have been made for the Fatimid Caliphs of Cairo. A ewer which is closely related to this one is in the Treasury of San Marco in Venice, which bears an inscription which names the Caliph al-'Aziz (975-996). Rock crystal ewer with carved decoration, Egypt (probably Cairo), 1000-50. 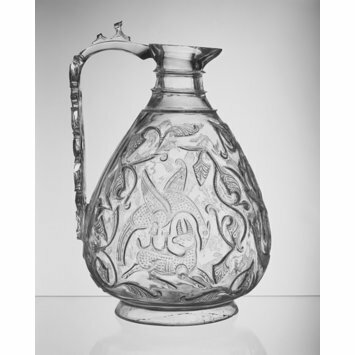 This rare ewer was carved from a single piece of the extremely hard, transparent stone known as rock crystal. On either side a bird of prey attacks an antelope. The image may have symbolised the ruler's ability to overcome his enemies. The plain surfaces, such as the band around the neck, were probably once covered with mounts of gold and other materials. These would have contrasted with the clear crystal, which one writer of the time described as combining the properties of air and water.